My hubby has been at a work conference in Copenhagen for two days and we figured it could be fun to have a little weekend adventure. So instead of taking the train going north I took the southbound train after work today. 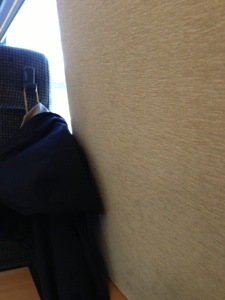 Around 3,5 hours later I found myself at the Copenhagen train station being greeted by my hubby and a co-worker of his. His co-worker took the train to Stockholm and we started walking towards the hotel which is located by the Town hall square. A short walk from the train station. 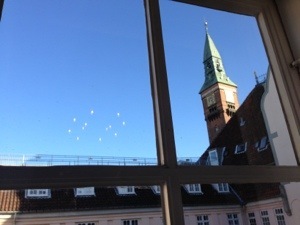 From our room we can hear the bell in the town hall every 15 minutes. I hope I can sleep tonight. 😉 The view from the room is the hotels courtyard and the tower of the hotel. 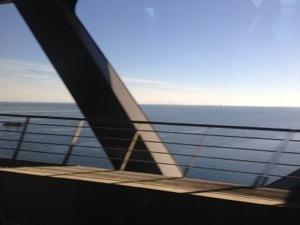 Luckily when we reached the city of Malmö most people got off and I switch ed to a real window seat so I could enjoy the ride over the Öresund bridge which connect Sweden with Denmark.